I was planning on taking outfit photos today but I woke up to a scene from some kind of 'end of the world' movie - torrential rain, countless power cuts, hail the size of golf balls, thunder, lightening, car alarms sounding and lights flickering on and off...I was home alone and pretty much scared for my life! Plus, IT'S JUNE! Whatever happened to summer eh? Annnyyways I had this post saved as a draft because I wanted to know if you guys have had any experiences with a rook piercing and what you thought of them. I was going to get my tragus re-done and then I started to look at alternatives and I love the way the rook looks with a bar. I prefer the positioning of the first image and think it's just something a bit different - loads of people now seem to have their tragus done and it was getting a little annoying when it came to wearing headphones. I got my rook pierced when I turned 16 (6 years ago), it took about 18 months to heel properly but I had no problems with it at all. 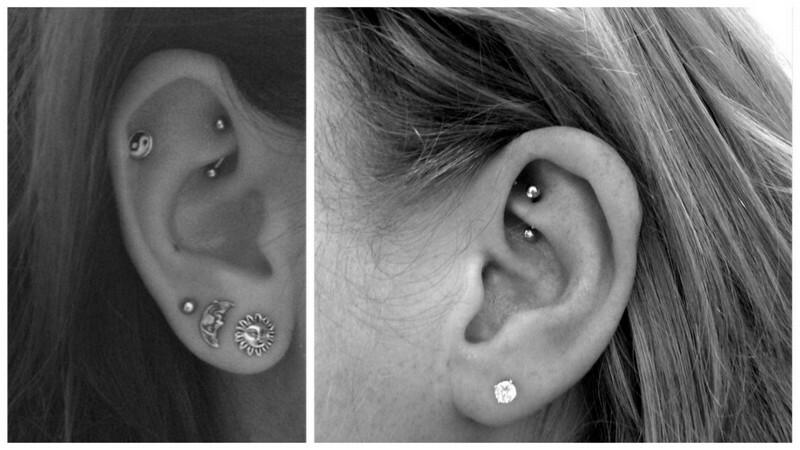 I actually have had a love more problems with regular cartilage piercings at the top of my ear. My rook did have a little scar tissue for around 6 months but then that disappeared. I've only changed my bar once though to a horseshoe but it's been absolutely fine. Just lots of saltwater will get it to heal nicely! Let us know if you get it done! i love the way the top one looks! aw these pics are so cool! Btw i have only 3 pierced ears on the lobe :), a nose piercing & the labret piercing. I really think that rook piercing is great :), do it babe ;P lol! I would go for it, you can always take t out if you dont like it! Ouchie! It looks great, but I'm a big ole woose so I could never have it done haha! i follow you back because your blog is just perfect. This is something I've always fancied getting done, especially since it's been a bout 6 year since I got my tragus pierced and now I want something new! 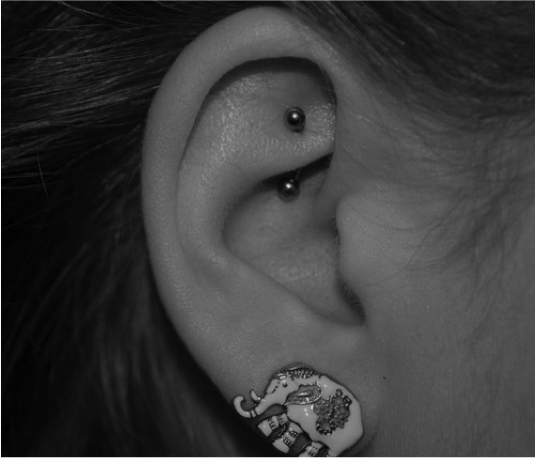 I do love the tragus though, it didn't hurt at all whereas the rook looks like it will kill! Keep us posted if you get it done! Ive had my rook done 3 times and it is a pain in the arse. My first two I got done a week apart,my first got badly infected to the point where I had numbing on the side of my face, my ear swelled up and I had no feeling in it and there was gunk coming out all the time.So its safe to say I needed antibiotics.I could have left my other one in but the doctor was a little concerned so I got both of them removed and let it heal,thankfully without an infection getting trapped. Not so thankfully leaving a bit of the cartilage where the piercing was caved in. I cant get that repierced though I have got a upper conch piercing that looks similar and has given me oodles less trouble. The other side however was fine and I got it repierced a year later. Its been a year since I had it done and it still gives me a little trouble when I sleep on it,or when I leave it out for hours because of work,but I generally just tell it to pipe the f down,put some ice on it and it stops sulking within a few days. If you can heal it properly its a great piercing and looks fab. Though can be fiddly getting the bar in and it will pitch a fit if you don't do it right so I would reccomend a horseshoe for the first year and a half(It takes ages to heal).